Get more clients with Words that Convert! Not writing good copy is costing you money. You need clients and no matter how many times you post on social media or how many emails you send, nobody's listening and nobody's buying. You just want consistent leads and clients because the "feast-or-famine cycle" is all too real, as many of us service providers know. You look at everyone else and they seem to have clients lined up, with a waitlist a mile long... but you don't want to come across as just another sleazy marketer. The first thing you gotta do before you start marketing your business is to truly know and understand your audience so you can speak their language. Without sounding scammy, you can mix these two languages and as a result, get more leads, clients, and sales. Good marketing copy doesn't have to feel weird or inauthentic. Inviting your audience to take your offers and services doesn't mean trying to force folks to buy something they don't want or need. When used correctly, good copywriting is a tool for serving your community and providing them with value. You don't need to sacrifice your integrity with the latest marketing tricks or hide your personality in a boring box.. When you're armed with Words that Convert you get the attention of your audience during sales conversations. Be it on the phone, on your social media platforms, in sales letters... doesn't matter, they'll work. And you won't feel dirty like you need a shower after using them. You don't have to be a copywriting expert or marketing master to infuse your marketing with words that convert. Customize these client acquisition email templates to fit your voice and audience. The templates include: Cold Email, Cold Email Follow Up, Event Follow Up, After Consultation Follow Up, Testimonial Request, Referrals Request, Repeat Work Invitation/Incentive, Offer for Retainer, After Referral Introduction, Client Onboarding. Whether you're writing to a loyal, long-term client or a potential client, incorporating these strategies will help you convey your message, in just the right way to connect in a way that makes the receiver feel appreciated, valued and at ease. Referrals help you build credibility and relationships with potential clients. Use this list to help you get referrals from current clients, colleagues, social media followers, etc. (Ex: Write a referral email* for clients to send to their friends, who are in need of a particular service you offer.) *sample email template included in this Ultimate Swipe File. You're a service provider who wants to use digital marketing to attract more of your best clients and you believe that good copywriting is a critical key to marketing that converts browsers into buyers. You're a service provider who wants to use copy that converts in your direct mail pieces, radio ads, brochures, etc. 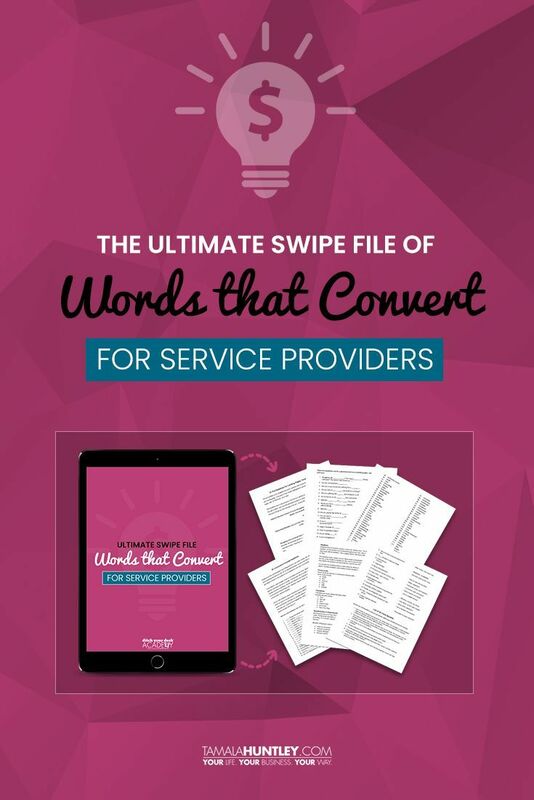 You understand that the Ultimate Swipe File is a collection of prompts, templates and examples that you can customize and use in your marketing copy and that it is not a comprehensive book or manual on copywriting. I love this Tamala! What a brilliant idea to put this together! I feel like my time and my money is saved already, seriously. Purchased it immediately! I got it And I love it! I have already used many of the lines and letters! I am not that creative when it comes to writing letters so this has been so helpful to me! Tamala Huntley is very creative! Thank you!